"As she shares her extraordinary stories of fighting human trafficking as an ordinary mom, Kimberly Smith offers hope for readers who wonder if God is calling them to greater things. 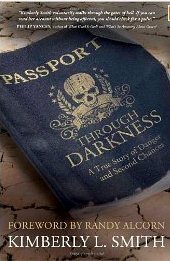 "Passport Through Darkness takes readers on Smith’s journey from normal family life and business, to Europe, to the deserts of Africa and ultimately, to the deserts of her own soul as she tries to live well as an imperfect American mom, crusade for justice for orphans around the world, and embrace God’s extraordinary dreams for her. When Kimberly and her husband risk everything to answer God’s call, they see God change and restore them—even amid exhaustion, marital struggles, and physical limitations. "This heartbreaking, heartlifting book is for anyone who longs to see God move their life from normal to one that matters. It is a call to readers to take one more step on their journey to know God’s heart." Learn more about Passport through Darkness. Be a hero for an orphan: get involved!